When you live in IRONMAN Wisconsin territory, it is not surprising to learn that triathlons are more popular than ever before. If you drive the roads of Dane County late afternoons and weekends, it is impossible not to come upon runners and bikers in bright colored jerseys getting their training time in. Exponential growth in the sport is not just a Dane County phenomenon. According to USA Triathlon, a membership organization that tracks the figures on this cross discipline sport, triathlon participation is at an all time high in the US, experiencing double digit growth for 8 of the past 10 years. According to a survey by the Sports & Fitness Industry Association (SFIA) nearly 2 million individuals competed in at least one triathlon in 2011.
Who are triathletes? Their average age is 38, with the majority of participants between the ages of 25 and 50. Nearly 60% are male; 40% are female. While triathletes pursue a wide variety of lifestyles and occupations, most are married, and many have children at home and work in office settings. FFP: What was your inspiration/motivation to enter thePardeeville Triathlon? "A woman I work with who has done many, many triathlons was forming a "team" and since the race fell on my birthday I thought it would be a nice way to challenge myself. I am primarily a runner...a slow one and always said I could never do a triathlon, but being encouraged by others convinced me and I made the jump." FFP: When did you decide to do the Tri and how did you prepare? "I did not decide to do the event until late April. That did not give me much time to prepare. My game plan was to do each sport 2x/week at the minimum." "I really enjoyed the cross training. I think it helped my running a bit. But I am an awful swimmer! A friend who had some swim coaching gave me some pointers. I also made sure to do some open water swimming and even participated in one Aquathon. Just something to work on for my next tri." FFP: What was your biggest challenge to competing in this race? "Open water swimming. I can do it but I panic and then just breast stroke, which is not very fast or efficient." FFP: What was the best thing about competing in the Pardeeville Tri? "Seeing my husband and kids along the course and at the finish line!" When asked how she felt about all the hard work and training, culminating in her first triathlon, Lisa expressed the attitude of many first timers who nervously eye the water course and then say, "I am as ready as I am going to be...now it is just time to enjoy." Did competing inspire Lisa to compete in future events? "Absolutely," she replied,"I am thinking of doing the (Race Day Events) tri series next year. I am also planning on doing the Waterloo Fit City Tri, Color Me Rad (purely for fun), and the Haunted Hustle." As a first time triathlete, Lisa was thrilled that race organizer, Race Day Events in conjunction with Focal Flame Photography provided complimentary photos as part of her race packet. "The photos were awesome! I was so excited that they were complimentary too...that NEVER happens in a race! She added,"If I had to pick between 2 races on the same day...I would pick the Race Day event." In a follow up email to Ryan Griessmeyer at Race Day Events, Lisa said in part, "Thanks for sponsoring Pardeeville Triathlon race photos from Focal Flame Photography!...This was my first triathlon that I have ever done! It is so awesome that I get some great pictures to go with my experience! Thank you!!!!" 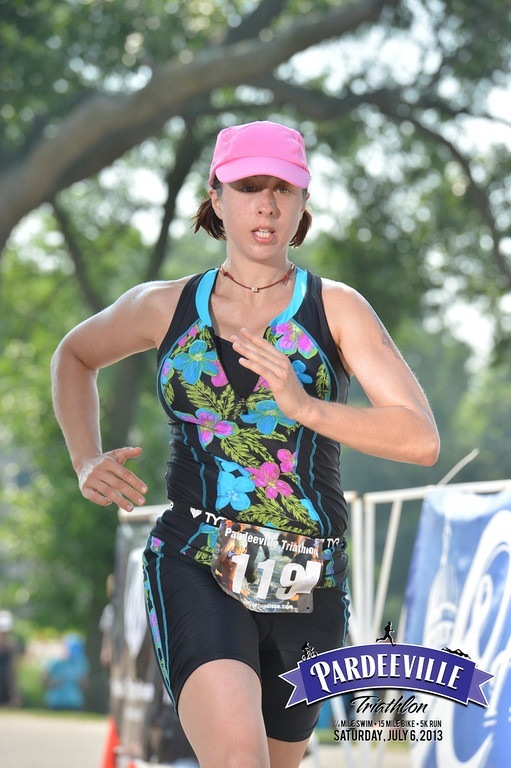 In the end, Lisa declared the Pardeeville Triathlon an "Amazing experience!" and a "Great way to spend my birthday!" It doesn't get much better than that. So how about you? Do you, like Lisa, feel that you could never do a triathlon? Does her experience encourage you to "tri"? Tell us why or why not on Facebook, Google+, or Twitter!